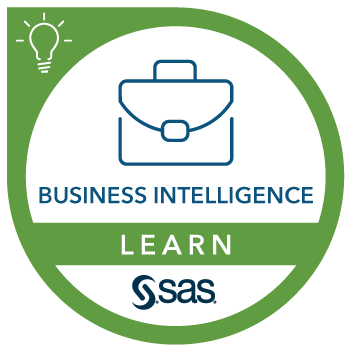 This course teaches how to explore data and build reports using SAS Visual Analytics. You learn how to build queries in SAS Visual Data Builder, and you also learn the basics of SAS Visual Analytics Administrator. This course can help prepare you for the following certification exam(s): SAS Big Data Preparation, Statistics, and Visual Exploration, SAS Visual Analytics 7.3 Exploration and Design. Interact with the environment via the SAS Visual Analytics Hub. Access and prepare data for exploration, analysis, and reporting. Explore data using the SAS Visual Analytics Explorer. Create reports with the SAS Visual Analytics Designer. Use the SAS Visual Data Builder and understand the capabilities of the SAS Visual Analytics Administrator. View reports using the SAS Visual Analytics Viewer and SAS Mobile BI. Exploring SAS Visual Analytics concepts. Using the SAS Visual Analytics home page. Exploring SAS Visual Data Builder. Exploring SAS Visual Analytics Administrator. Selecting data and defining data item properties. Interacting with visualizations and explorations. Examining the SAS Visual Analytics Designer interface. Creating data items and working with graphs. Working with filters and report sections. Establishing interactions, links, and alerts. Working with gauges and display rules. Using custom graph objects in a report.